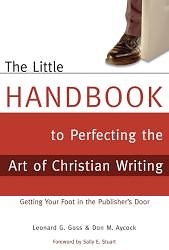 In The Little Handbook to Perfecting the Art of Christian Writing, two publishing industry veterans have much to share beyond choosing subject matter, improving grammar, and strengthening sentence structure. Yes, those elements definitely matter and are duly addressed, but there are other skills to be polished if one wants to get a proverbial foot in the publisher's door.Readers will gain an insider's view of how the Christian publishing industry actually works. Key topics include building relationships with agents and editors, keeping up with industry trends, developing a strong book proposal, the growth of electronic publishing, and more. For anyone called to Christian writing, this release provides the "know-how" that is needed to further the inspiration.